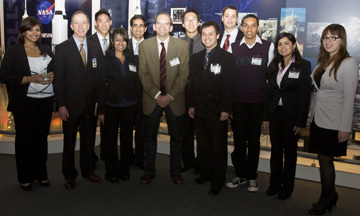 Dean Hal Stern (center) with student leaders from various Bren School organizations, including the ICS Student Council and WICS. Three Bren:ICS student organizations and a freshman computer science major took home Anteater Awards at a May 18 ceremony, for their achievements throughout the 2010-11 academic year. The year-old ICS Student Council was named Most Outstanding Social/Support Organization and was a runner-up for Most Outstanding Executive Board. Most Outstanding Special Interest Organization went to Women in Information and Computer Science (WICS); the Video Game Development Club was a finalist in the same category. Freshman Nithin Jilla, founder of Kenya Dream at UCI — a student and community-based organization dedicated to improving secondary education facilities in Kenya — won President of the Year. “Being part of Kenya Dream is something I love to do and something I'm passionate about, so my involvement doesn’t feel like work,” says Jilla, who credits part of his leadership skills to lessons learned in the classroom. For WICS president Rachita Gehi, the Anteater Award symbolizes the WICS board and members’ hard work over the past year. They’ve been busy organizing such events as information sessions hosted by Fortune 500 companies, a mentorship program and a conference funded by the National Center for Women & Technology. “Our goal is to build a strong bond among our peers and to offer them the necessary support they need to succeed as Bren:ICS students,” she says.